Welcome to Linda Ikeji's Blog: How Good A Father Are You? 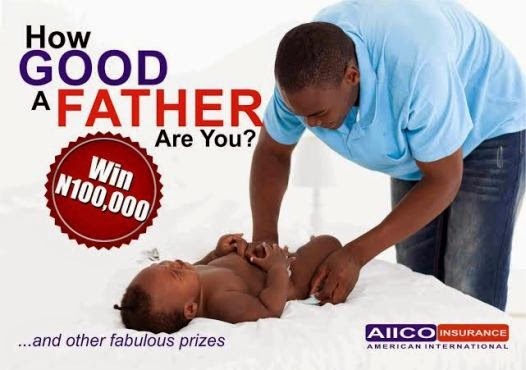 In celebration of this year’s Father’s Day, AIICO Plc has announced its ‘How Good a Father Are You? Contest’. Do you know you could win N100,000 by uploading a father/child picture in that very emotional moment? Post a favourite photo of your child or children with their Dad and our lucky winner will win N100, 000.00 (One Hundred Thousand Naira). Second and third positions will also win N50, 000.00 (Fifty Thousand Naira) and N30, 000.00 (Thirty Thousand Naira) respectively. There are also other fabulous prizes to be won. · Take a photograph of that awesome moment. Entry closes by 12pm on Wednesday, June 18, 2014 and our winners will be announced on Friday, June 20, 2014. Finally fathers are being remembered. This is inspiring, Fathers are role models. OmG! Cant believe dis is coming 4rm aiico life don beta. My hobby is a great dad. Father's changing those pooped baby diapers :P, changing clothes, taking them out & many things.